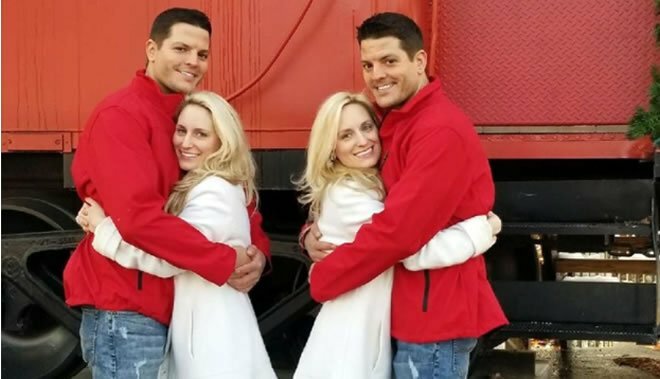 Bulsha:- A set of identical twin sisters will fulfill their dream when they marry a set of identical twin brothers in a joint wedding this summer. The Lynchburg News & Advance reports Jeremy and Josh Salyers proposed to Briana and Brittany Deane on Feb. 2 at Virginia’s aptly named Twin Lakes State Park. The engagements came six months after the pairs met at the Twin Days Festival, which bills itself as the world’s largest annual gathering of twins and other multiples, in Twinsburg, Ohio. The 31-year-old Deanes had visited the festival, which Brittany calls “a magical place,” since their first year of law school, the first time they had been apart. The Salyers made their first festival visit in 2017 and “lucked out on (their) first attempt,” as Josh puts it.